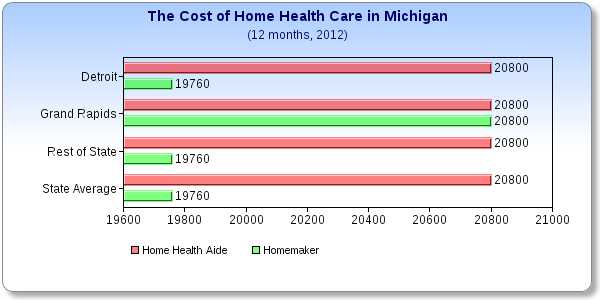 What does Home Health Care Cost in Michigan? If you or a family member needs home health care, and you live in Michigan, plan on it costing about $20 per hour. That's the average cost in the state for a Health Aide, according to a survey published by the MetLife Mature Market Institute*. The yearly cost of $20,800 is based on an estimate of 4 hours per day, 5 days per week. *The yearly cost will vary depending on the number of hours per day and the number of days each week that a patient needs help. 2012 data. A Health Aide is not the same as a skilled medical worker like a nurse or therapist. The Health Aide is trained to provide ongoing support with Activities of Daily Living (ADL's) such as bathing, dressing, transferring, eating, toileting, or continence. The other type of work listed in the survey was a Homemaker, which provides companion type assistance that could include light housekeeping, meal preparation, transportation, and companionship. This type of care is often appropriate for those with Alzheimer's disease or other forms of dementia who may be physically healthy but require supervision. Homemakers and companions are not trained to provide hands-on assistance with ADLs such as bathing and dressing. Health aide and home care services (homemakers), are usually provided in two-to-four-hour blocks of time referred to as "visits." They generally cost more in the evening, on weekends, and on holidays. For more information about the levels of workers, see: Home Health Care Nurses, Aides and Homemakers. The rates for a Health Aide ranged from a low of $15 to a high of $33. The 2012 average was a dollar more than the 2011 average of $19 per hour. Homemaker aides usually cost less than health aides. The average cost in 2012 for a homemaker was $19 per hour. The range of rates reported was $15 to $33. The average rate in 2011 was reported as $18 per hour. Michigan, Montana and Kansas are all tied as the 21st highest for the cost for Home Health Care in the United States. New Mexico ranked just above, and Oklahoma and Tennessee ranked under.The United States average cost for a Health Aide was $21 per hour. A Homemaker Aide was $20. For comparison, the average daily cost for a private room in a nursing home was $248 ($90,520 annually). The monthly private-pay base rate in an assisted living facility with one-bedroom apartments or private rooms with private baths was $3,420 per month ($41,040 for 12 months). The average cost of Adult Day Services (Adult Day Care) was $81 per day ($29,565 for 365 days). The averages given here do not include the costs of a skilled medical worker like a nurse or therapist. You must add those expenses (and any other) to the costs shown here to estimate the full cost of Home Health Care. Data was compiled using hourly/daily cost averages as published in the MetLife Mature Market Institute Market Survey of Long-Term Care Costs.This survey information came from the MetLife Mature Market Institute. The full report is available at the Institute's website. "MetLife provides a "State Average" for each type of long-term care service in each state -the average of all rates for all sampled services in the state. In the states where MetLife includes average rates for one or more cities or areas within a state, these averages are specific to those areas." Our Our privacy statement is very simple.